Environmental Education: is the teaching about the natural and built environment which provides a real-world context for learning by linking the classroom to the students' community. Students are engaged in hands-on, active learning that increases their knowledge and awareness about the environment. Because environmental education encourages inquiry and investigation, students develop critical thinking, problem-solving, and effective decision-making skills. Environmentally literate* students become citizens who are able to weigh various sides of an environmental issue and make responsible decisions as individuals and as members of their community. Quality, standards-based environmental education improves everyday life by protecting human health and encouraging stewardship of natural resources. *Environmental literacy: is the capability for a contextual and detailed understanding of an environmental problem in order to enable analysis, synthesis, evaluation, and ultimately sound and informed decision making at a citizen's level. This means that "environmentally literate" students will have the knowledge, tools, and sensitivity to properly address an environmental problem in their professional capacity, and to routinely include the environment as one of the considerations in their work and daily living. Environmental Science: focuses upon the scientific principles, concepts, and methodologies required to understand the interrelationships of the natural world, to identify and analyze environmental problems both natural and human-made, to evaluate the relative risks associated with these problems, and to examine alternative solutions for resolving and/or preventing them. There are several major unifying constructs, or themes, that cut across the many topics included in the study of environmental science. 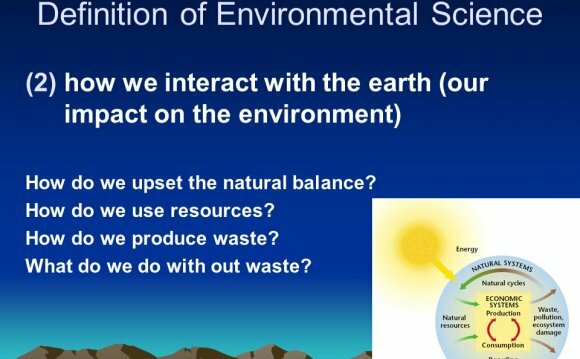 The following themes provide a foundation for the structure of an Environmental Science course. Energy conversions underlie all ecological processes. Energy cannot be created; it must come from somewhere. As energy flows through systems, at each step more of it becomes unusable. The Earth itself is one interconnected system. Natural systems change over time and space. Biogeochemical systems vary in ability to recover from disturbances. Understanding the role of cultural, social and economic factors is vital to the development of solutions. Human survival depends on developing practices that will achieve sustainable systems. A suitable combination of conservation and development is required. Management of common resources is essential. Project-based learning (PBL) is an inquiry based process for teaching and learning. In PBL, students focus on a complex question or problem, then answer the question or solve the problem through a collaborative process of investigation over an extended period of time resulting in a product, presentation, or performance. Projects often are used to investigate authentic issues and topics including those found outside of school. Using this process, students learn content, information, cross-curriculum skills, and facts necessary to draw conclusions about the question or problem. While Project-Based Learning and Problem-Based Learning share much in common, they are two distinct approaches to learning. In Problem-Based Learning, a specific problem is specified by the course instructor. Students work individually or in teams over a period of time to develop solutions to this problem.